One of my favorite things in the fall is sitting by the fire in the evenings. You may have seen this photo when I shared it the other night on my Facebook and Instagram, but in case you missed it, :) sitting right here in this spot getting all cozy really is one of my favorite fall rituals. I turn on the lamps, shut off the bright overhead lights, and curl up on the sofa or a chair to read, write, or just chat with whoever is around. We don’t have a TV in this room so it is really quiet and peaceful. I look forward to the evenings so much in the fall! 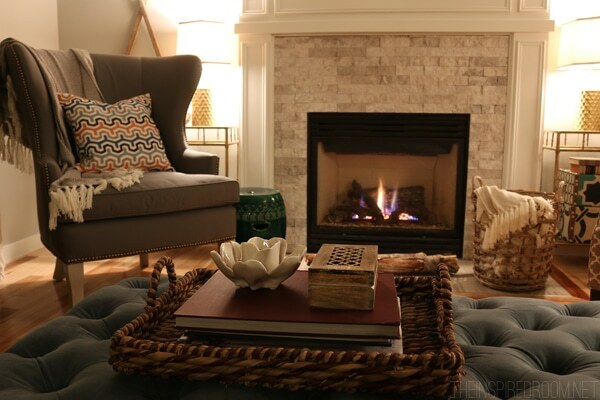 Do you have a fireplace you can curl up by on a chilly fall evening (as soon as it is cool enough where you live!)? 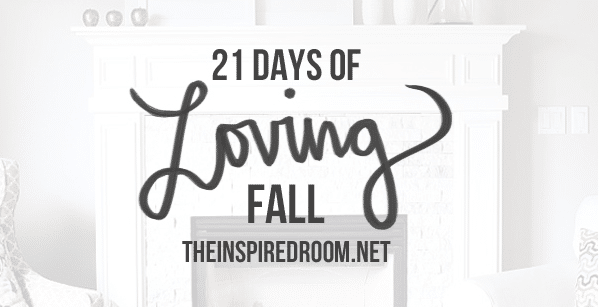 Even if you don’t have a fireplace, you can light a few candles and maybe start a new fall evening ritual as a gift to yourself, relaxing by the flickering flames of a warm fire. Beautiful and so cozy. Just wondering the paint color on your walls? Fall is my favorite season!! I look forward to building a fire and enjoying quiet time at home with my family. Thanks for sharing! Yes! We enjoy the ritual of the fireplace pretty much every day once the weather turns cool. My husband even grills right in it all season long. He just roasted a big bunch of red peppers over the fire this week. There’s nothing like the mesmerizing sight and crackling flames. It isn’t quite cold enough for me for a fire in the woodstove (plus it is surrounded with stuff still) but I do light candles plus I added a tiny string of lights to the dining room window sill. I am searching for a light “curtain” with hanging starts that I saw in a photo. No luck yet. This looks like such a lovely and cozy place to curl up on a cool autumn evening! I agree, it’s one of my favorite parts about fall. Although I love how the summer brings people out of their homes and onto the streets to interact and pass their days together. There is something special about after a busy summer of running here and there, visiting with this and that person. It just pulls on my heart string! Happy Friday. Hope you have a great and relaxing weekend! Thanks, Rebecca :-) You too! Thanks Joanne :-), I’m glad you are enjoying the article! YAY! We got one of those electric fireplaces for our church and it really makes for a cozy spot!! Such a pretty room, Melissa! Melissa, What a lovely fireplace you have! 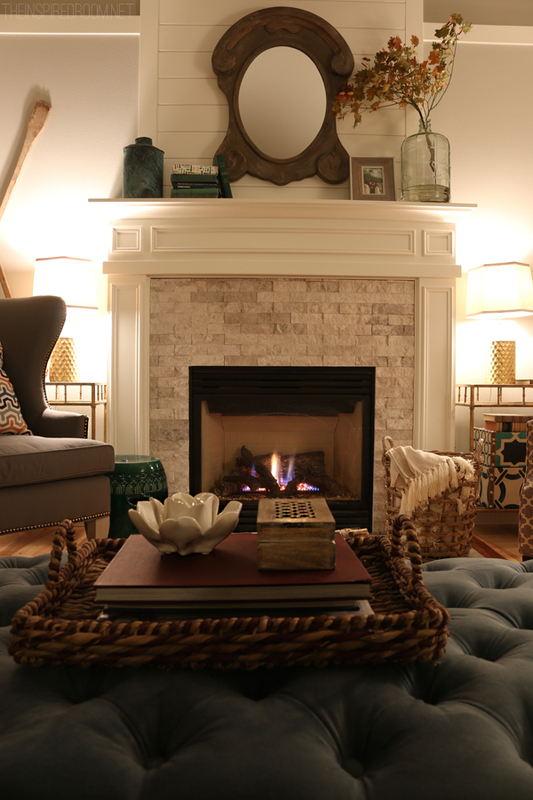 I too love to curl up with a good book and the fireplace going in the fall and winter…candles burning too, of course! Today was a good day to settle in with the dark clouds and drizzle. Happy Friday! It sure was dark and drizzly! Have a great weekend, Gracia!! Good for you Angelika!! Keep the home fires burning in every way you can :-). It’s amazing how even just a few lit candles can transform your evening! How beautiful, I was going to ask about the paint colour, but I see you’ve already replied to that question. I love the colour and its name. Your home is so lovely, and I really love the cozy factor. I LOVE fireplaces, but we don’t have one at our current home. Hopefully one day we can get one of those ones that looks like a fireplace, but it really a heater. I was wondering where your tufted coffe table was from, and the size. Thank you!